This film stars Sean Bean (Lord of the Rings), Eddie Redmayne (The Other Boleyn Girl), and Carice Van Houten (Black Book). The film is directed by Christopher Smith who directed the British Horror Comedy, “Severance”. The year is 1348. Europe has fallen under the shadow of the Black Death. As the plague decimates all in its path, fear and superstition are rife. In this apocalyptic environment, the church is losing its grip on the people. There are rumors of a village, hidden in marshland that the plague cannot reach. There is even talk of a necromancer who leads the village and is able to bring the dead back to life. Ulric (Sean Bean), a fearsome knight, is charged by the church to investigate these rumors. 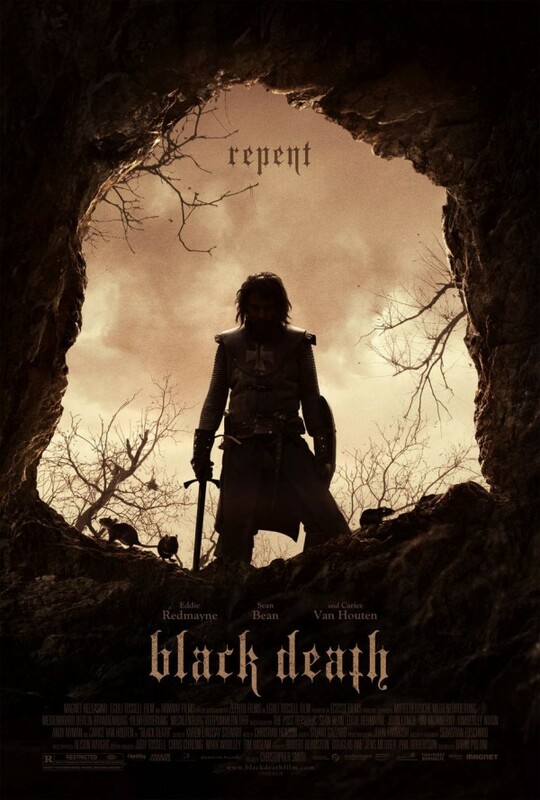 He enlists the guidance of a novice monk, Osmund (Eddie Redmayne) to lead him and his band of mercenary soldiers to the marshland, but Osmund has other motives for leaving his monastery. Their journey to the village and events that unfold take them into the heart of darkness and to horrors that will put Osmund’s faith in himself and his love for God to the ultimate test. Look at the trailer below. I have a few “Black Death” movie t-shirts to give away. In order to win you will have to comment on this post with your answer to the question I will give that somehow relates to the film. The first seven people to respond with the correct answer will win. If you have won, please email me at boomstickcomics@gmail.com with your shipping info. Also please follow me on twitter HERE to see the question as well. “Black Death starlet Carice Van Houton was in another film with comedian/actor Eddie Izzard. What was that film called?? Remember to comment with your answer below. This entry was posted on Tuesday, February 22nd, 2011 at 2:37 pm	and is filed under Film, News. You can follow any responses to this entry through the RSS 2.0 feed. You can skip to the end and leave a response. Pinging is currently not allowed. « Nite Owl to Primetime Owl!! !